Loweswater Apartment Self-cateringLoweswater apartment is situated in the pretty hamlet of Mockerkin, close to Loweswater and the Buttermere Fells. Our first floor apartment is owner managed and tastefully furnished, with every modern day convenience to provide an ideal location for a relaxing holiday, and explore the Western Lakes and Cumbrian coast. The apartment is fully self contained with its own private entrance and parking space. All heating, electricity, linen, towels and Wi-Fi are included. A spacious sitting room, with French doors providing stunning views over the countryside, is fully carpeted and has two settees for your comfort. The room features a cast iron gas stove. A large selection of books, guides and maps are provided. A fully-fitted kitchen is equipped with freezer, fridge, washing machine, tumble dryer, electric cooker and microwave. Two attractive bedrooms, with double beds are fully carpeted and comfortably furnished, with lots of storage. A fully-tiled bathroom has a bath with overhead shower, hand basin, toilet and heated towel rail. 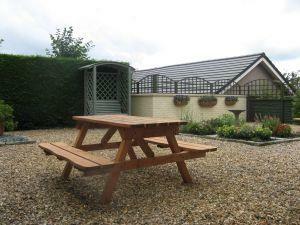 Attractive enclosed courtyard with picnic tables and garden furniture. Secure bike store. Loweswater is situated in the tranquil village of Mockerkin, close to Loweswater and the Buttermere Fells. The first floor apartment is very spacious, light and furnished to a high standard. Heating, electricity, linen, towels,Wi-Fi incl. Loweswater Apartment offers weekly bookings starting on any day and sometimes short breaks. From M6 jct 40 turn onto A66, pass Keswick onto Cockermouth Island with the Sheep centre on the left. Turn left onto A5086, for about 10 minutes. Take the sixth road on left ( the signpost for Loweswater and Mockerkin is located on the right-hand side of the road). When entering the village, take first left turn, at junction drive straight on, Sosgill Road. Mockerkin Mews is about 100 metres along Sosgill Road on the right. Allocated parking is indicated in the car park. This was a lovely quiet location and a well appointed apartment with great facilities. Thank you so much for a lovely review. We are glad you appreciated the facilities at the apartment and enjoyed the quiet location of the Western Lakes. Please do think of us again if you plan to return to this area. A very warm welcome would await you. Thanks again for staying at Loweswater apartment.